Falvey Memorial Library :: Need a Measurement Instrument? C’mon, Get HaPI! Need a Measurement Instrument? C’mon, Get HaPI! Want to gather data in some area of health or psychosocial sciences? Wondering if a questionnaire, interview schedule, checklist, rating scale or some other measurement instrument already exists? Now you can stop wondering and get HaPI. 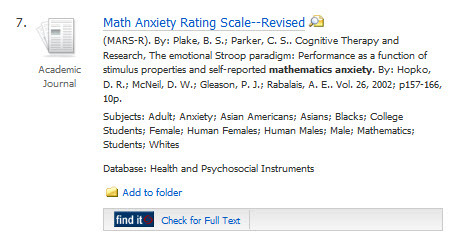 Health and Psychosocial Instruments (HaPI) is a database that provides references to journal articles and monographs containing information on approximately 15,000 measurement instruments. While the full-text of the instruments is not included in the database, HaPI can help you discover the titles of instruments that exist and determine their reliability and validity. The library has access to many of the journals and books cited in the database or can obtain them for you through ILLiad. In addition, the full text of instruments are often included in the appendix of dissertations and can be found by searching the instrument titles in Dissertations and Theses Full Text. NOTE: HaPI is not to be confused with the database bearing the same acronym, Hispanic-American Periodical Index.